In the past decade and more, we have danced all over the place. NBCDS dances have moved around, always looking for the perfect dance halls in Sonoma County and Marin County. 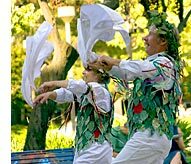 Our dances have grown to include more styles of dancing, more locations, both local and imported bands and callers, and many special events, workshops and dance weekends. All regularly scheduled Contra and English Country dances feature a beginners’ orientation about a half-hour before the official beginning of the dance. For the past few years, due to concerns over our struggling economy, NBCDS has resisted the need to raise prices at our dances. Recently the Board agreed they could no longer ignore the rising cost of dance hall rents and other increasing expenses. They voted to raise dance prices in 2012. Beginning February 1, the new rates will be $10 for members (SO JOIN NOW – provide a link to membership form), $12 for non-members, and $7 for students, young adults, and those with financial hardship. Most special dances will be $12 for members and non-members. Despite the fee increase, dancing to live music is still one of the most affordable and enjoyable entertainment options around. $2 for children ages 6 – 17, and under age 6 free. Admission rates for special Contra and English Country dances are often higher as these may have national talent, be special events, are of longer duration, or are holiday events.